The Red Sox have prioritized landing a catcher on a short-term deal this offseason so as not to block the paths of prospects Blake Swihart and Christian Vazquez, and they accomplished that goal by landing A.J. Pierzynski. Boston officially announced a one-year deal for Pierzynski today. Pierzynski, who is represented by agent Steve Hilliard of Octagon, will reportedly receive an $8.25MM guarantee on his one-year pact. Terms are not yet known on Pierzynski's contract, but it's fair to suggest he could find two years with Carlos Ruiz getting three and Dioner Navarro getting two. 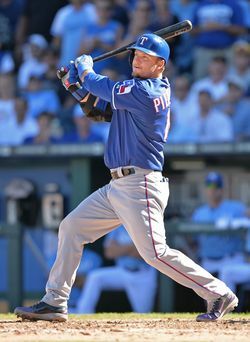 Pierzynski, 37 later this month, signed a one-year deal with the Rangers last offseason and went on to hit .272/.297/.425 with 17 home runs in 529 plate appearances. As MLBTR's Steve Adams mentioned in Pierzynski's free agent profile, he offers good power for the position and has displayed perhaps the best durability behind the dish in baseball. Pierzynski will be paired with David Ross in Boston. The contract represents the first free agent deal of the offseason for the World Champion Red Sox, who still need to address first base at the least with Mike Napoli a free agent. The Twins and Blue Jays were reportedly among the other teams showing interest in Pierzynski this offseason. Pierzynski is already the seventh catcher to sign a Major League deal, following Brian McCann (Yankees), Carlos Ruiz (Phillies), Dioner Navarro (Blue Jays), Jose Molina (Rays), Brayan Pena (Reds), and Francisco Pena (Royals). Saltalamacchia now appears the only starting option on the free agent market, though it's possible the newly non-tendered J.P. Arencibia could get significant playing time with a new team in 2014. In addition, the Reds seem likely to trade Ryan Hanigan. Jon Heyman of CBS Sports first reported the agreement. Sean McAdam of Comcast Sports Net New England reported that it was a one-year deal (via Twitter), and ESPN's Buster Olney reported the $8.25MM value (also on Twitter).